Problem: there are times when electrical equipment must be installed in a classified hazardous location but protection methods such as intrinsic safety or explosion-proof boxes are unsuitable or impractical. Solution: applying a source of clean air or inert gas at a positive pressure to an equipment enclosure prevents the ingress of flammable gases and dust. Thus, the hazard classification of the atmosphere inside the enclosure may be reduced. Standards have been established which determine the degree of reduction, and stipulate initial purging volume changes, minimum maintained pressure differential, and system status indication. Alarm initiation and power interruption in the event of pressure loss are mandated for some situations. Type X pressurization reduces the hazard classification from Division 1 to non-classified. 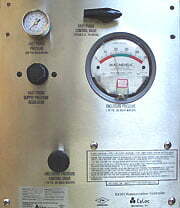 Type Y pressurization reduces the hazard classification from Division 1 to Division 2. 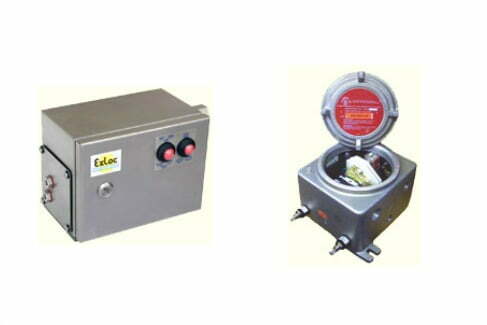 Type Z pressurization reduces the hazard classification from Division 2 to non-classified. Systems for leakage compensation are designed to maintain a minimum positive pressure. Continuous flow systems are for enclosures with internal gas releases, e.g. analysers. Enclosure volume must be checked against the flow capability of the purge control system. A fast purge feature expedites the required number of air changes for system initialization. EX301 for enclosures up to 15 cu. ft in volume. EX302 for enclosures up to 75 cu.ft. in volume. EX303 for enclosures up to 300 cu.ft. in volume. 1XLC — enclosures up to 60 cu. ft in volume. 2XLC — enclosures up to 120 cu.ft. in volume. 3XLC — enclosures up to 240 cu.ft. in volume.